Andy Whitson has been cooking for thirty years (all his working life) and is French classically trained. For the last fifteen years he has worked as a college senior chef lecturer winning many awards in national and international culinary competitions and captaining senior teams and student teams to great success. Andy has a vast amount of practical experience and knowledge which he openly shares with his Oui Chef students so that they gain the ultimate cooking holiday experience. Andy has worked in various restaurants since qualifying as a chef and lecturer, including teaching at The Army School of Catering for eight years and Rüdesheimer Schloss, West Germany. Andy is also quite a dab hand at food sculpture using icing sugar and corn flour . . .
A: Leonardo da Vinci. How can one man cram so much into his life! 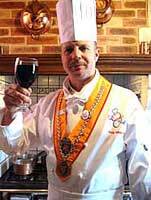 A: In the past it has to be Escoffier as he was a great chef and heightened the profile of cuisine. Today its Rhodes and Ramsey. Two different attitudes I know, but they both know their craft. A: My wife. As we never get the chance to these days. A: It would have to be 'Peaches' by the Stranglers. An old family favourite. A: Quite partial to foie gras on brioche, but a good 'pot au feu' is hard to beat. A: French of course, but Thai comes a close second. A: Being able to do what I want to do. Q: How would you describe France to someone who's never visited it? A: The people are very helpful and kind. There is lots of space and the roads are easy to drive on. Q: What are, to you, France's main attractions? A: The food. The markets. There is a good family unity here. Oh and the Eiffel tower! A: We do a lot of entertaining at home and visit our French neighbours quite regularly for long enjoyable meals. A: 'Moules a la Normande' Mussels cooked in cider and crème fraiche. Absolutely delicious! A: For a long time I had a dream to have my own cookery school, I am now living that dream. A: We cater for all ages and abilities. One of our guests was 93 years old and she made a mean Boeuf a la Bourguignon. Our youngest guest was 13, he came on the cooking holiday with his parents as he wants a career as a chef. A: The customer is always right! I always value other people's opinions. A: No. It is their choice of holiday and it is my job to give them a good hands on fun packed experience no matter how basic their technical skills are.